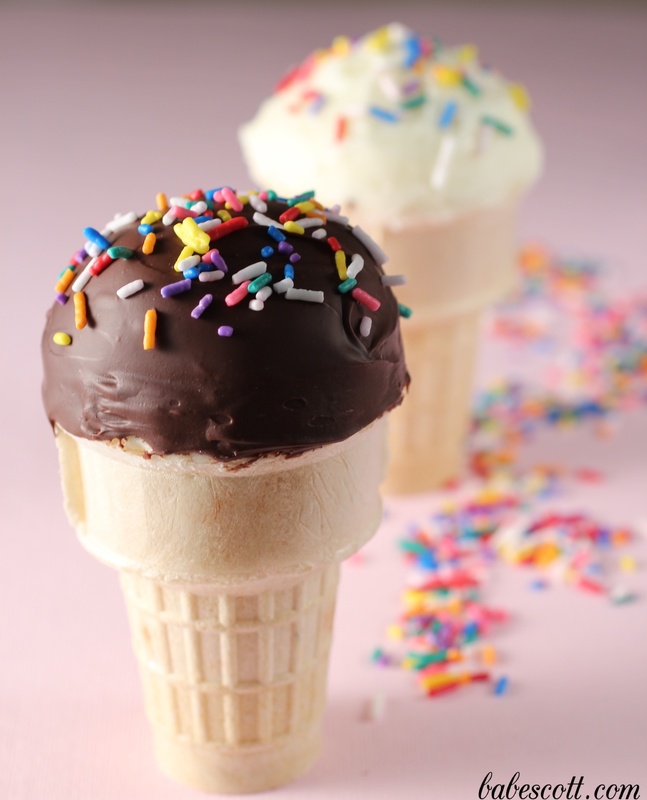 These vanilla ice cream cone cupcakes give new meaning to the phrase “let’s share a cone.” They are adorable and extremely easy to make. I baked up a batch and served them both plain and as a “choc top” and accessorised with sprinkles. Perfect for an afternoon of procrastibaking! 2. While eggs are cold, separate them, placing the yolks in one bowl and whites in another. Cover the two bowls with plastic wrap and allow the eggs to come to room temperature. 3. In a medium bowl, whisk together cake flour, baking powder and salt and set aside. 4. In a separate bowl, beat butter and ¾ cup of sugar with a mixer until fluffy. Add the egg yolks, one at a time, beating well after each addition. Add vanilla and mix again. 5. Reduce mixer speed to low. Add the dry ingredients to the butter mixture in two parts, alternating with milk, and mix until all is combined. 6. In a clean bowl, beat the egg whites with a mixer until foamy. Add the cream of tarter and beat until soft peaks form. Gradually add the remaining ¼ cup sugar and continue to beat until stiff peaks form. Gently fold the egg whites into the batter until combined. Do not overmix. 7. Fill ice cream cones about two-thirds full with batter. If you like, you can use a mini ice-cream scooper to make it easier. Place cones in a muffin tin and bake for 18-20 minutes or until a toothpick inserted into the center comes out clean. Let cook completely before frosting. 1. In a medium bowl, beat the butter with a mixer until creamy. Add sugar, one cup at a time, beating after each addition. Add vanilla and milk and mix until light and fluffy. 2. Pipe on top of cooled cupcakes using a pastry bag and tip or plastic bag with the corner snipped off. 1. In a microwave-safe bowl, combine the chocolate chips and canola oil. Microwave on high for 20-30 seconds at a time, stirring in between, until chocolate is melted. Do not overheat the chocolate. 2. Allow the chocolate to cool slightly. Holding the bottom of a cone, dip the frosted cupcake into the chocolate to coat. Allow the excess chocolate too drip off and add sprinkles. Place in the fridge for 5-10 minutes to harden.